Spectroscopy, the study of the interaction of light and matter, is utilized as an experimental technique in chemistry (IR/Raman), physics (NMR/Xray), biology and nanotechnology (UVVis/circular dichroism), and many other scientific fields. Despite widespread interest, spectroscopy software development is not often a research focus; researchers traditionally rely on commercial software bundled with instrumentation, such as a benchtop spectrometer, or a Raman microscope. Such software is expensive and usually tailored to a particular research domain or application. Open-source solutions are less abundant, and also tend to be specialized. Python has emerged as a swiss-army knife for scientific research, due in large part to a core group of scientific libraries known as SciPy, perhaps the most prominent of which are NumPy, Pandas and IPython. To integrate with the SciPy ecosystem, new libraries must be NumPy-compatible. For example, the scikit-image1 library stores images as pure NumPy arrays, while Pandas’ primary datastructures are directly subclassed from NumPy arrays. In regard to spectroscopy in Python, a handful of domain-specific, SciPy-compatible libraries are available; for example, NMRGlue and PySpecKit are great resources for nuclear magnetic resonance and astronomy applications, respectively. Interoperability between Python’s spectroscopy libraries is challenging, even when they are NumPy-compatible. The primary difficulty arises in storing metadata. Spectral data is tabular: a matrix of n spectra measured at m timepoints, or more generally, m variational points, with labeled rows (e.g. wavelength) and columns (e.g. time). Most would recognize this datastructure in an Excel Spreadsheet. Fortunately, tabular data is already well-supported in Python by the widely-used Pandas library. Pandas provides an intuitive, NumPy-friendly API for IO, plotting, statistical analysis and data manipulation. Unfortunately, it’s not straightforward to simply repurpose Pandas for spectroscopy, since Pandas datastructures don’t preserve arbitrary metadata, nor do they support conventional Python subclassing. Such obstacles reduce Pandas’ applicability to spectral analysis. Nearest-neighbor slicing to index data based on an approximate range of values. 2D and 3D contour, waterfall, auto-correlation, and other spectral plots seamlessly integrated into pandas’ pre-existing plotting API. Unit-aware indexing objects for easy unit conversions and integration with the plotting API. IPython Notebook graphical user interfaces (GUIs) to expedite many common tasks such as resampling, normalization, and plotting without ever leaving the notebook environment. Spectra and Spectrum classes to replace the Pandas DataFrame and Series, respectively. These objects retain all of the functionality of their Pandas counterparts, and add capabilities such as persistence of metadata, the notion of baseline and reference spectra, and reversible spectral normalization: for example converting raw data into a transmission(T), percent transmission(%T), or absorbance(A) spectra. Scikit-spectra’s core datastructures are the Spectrum and Spectra, which behave as if they were directly subclassed from the Pandas Series and DataFrame, respectively. Spectrum and Spectra are actually composite classes: pure Python classes that store both a Pandas object and metadata attributes; however, to the end user, operate identically to Pandas objects. In the future, scikit-spectra may be refactored to truly subclass from Pandas objects, as libraries like GeoPandas and Xray have recently shown how to do this properly. In addition, scikit-spectra provides a SpecStack class for operating on multiple Spectra, analogous to the Pandas Panel class. SpecStack provides basic functionality for operations on multiple datasets, but does not try to emulate the API of the Panel. The short, full and symbol attributes ensure new units will automatically interface to the indexing and plotting systems. Scikit-spectra includes graphical applications developed fully with IPython’s widget API, and is one of the first libraries to do so. The documentation is built with Sphinx, using the Bootstrap theme, and sphinx gallery extensions; and is heavily inspired by the scikit-image and scikit-learn docs. 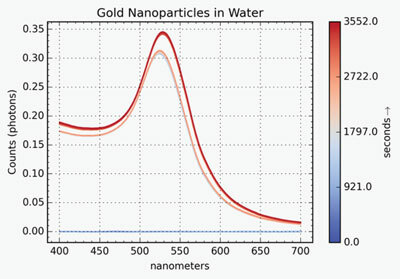 To illustrate some basic functionality of scikit-spectra, data are analyzed from a system of gold nanoparticles (AuNPs) in a cuvette of water before and after protein has been added to the solution. Binding between the protein and the nanoparticles yields a characteristic shift towards long wavelengths in the absorbance spectrum of the gold, known as the localized surface plasmon resonance[14, 15]. For brevity, a bundled dataset, aunps_water(), is used; however, reading data from a CSV file is quite easy, as scikit-spectra wraps Pandas’ powerful read_csv() parser. The iloc indexer was used to display only the first five rows and columns, as seen in Table 1. If working in the IPython Notebook, Spectrum and Spectra objects will automatically render as HTML tables, with metadata attributes such as name, units, shape, baseline; and reference and normalization states, shown in the header. The ability to store arbitrary metadata is crucial to repurposing Pandas for specific applications. HTML output of first five rows and columns of gold nanoparticles in water. This built-in dataset is preset with a stored baseline and reference spectra, and has column labels of timestamps. In this dataset, the baseline comes preset, but is not subtracted. The dataset (baseline and reference spectra are plotted as dashed lines for clarity) is shown in Fig. 1. 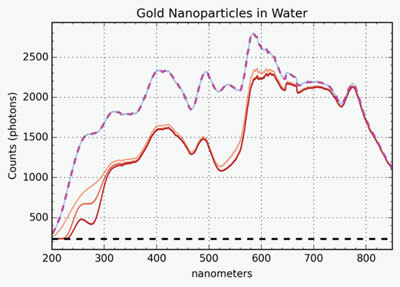 Gold nanoparticles in water visualized: the data is stored in a TimeSpectra class. Baseline and reference are overlaid as dashed lines in black and magenta, respectively. Reference is user-selected, in this case set to the first curve in the dataset. where An(λ) is the absorbance of the nth curve, Sn(λ) is the spectrum, Rn(λ) is the reference spectrum, and Bn(λ) is the baseline. The absorbance data tend to be very noisy in the short wavelength region, due to the small signal in the raw data, so the usual procedure is to crop the values between 400–700nm. The nearby() method invokes nearest-neighbor slicing to index over an approximate range; for example, nearby[400:700] will automatically find and slice between the closest spectral index values, in this case 400.36–699.58nm. The curves in Fig. 2 show the surface plasmon resonance around 525nm and its clear shift to the right after proteins are added. Absorbance of AuNPs increases after the addition of bovine serum albumin protein, due to binding between the protein and gold surface. The amount of protein bound to the surface is related to the size of the shift in peak position. The plasmon resonance refers to the wavelength at which the nanoparticles maximally absorb, An(λmax). Prior to analysis, the first few curves must be eliminated. These correspond to the timepoints taken prior to the addition of nanoparticles to the cuvette; that is, An(λmax) = 0. This is most easily done through boolean masking, which nicely exemplifies the notion of NumPy-compatibility. The blue curves in Fig. 2 correspond to timeseries taken before the addition of nanoparticles. To remove these and retain only the subset of curves with significant absorbance, a mask is defined with a lower threshold of 0.10 absorbance units. The new TimeSpectra, ts_cut, retains only curves after the addition of AuNPs, the timepoint when the absorbance maximum rises above the threshold value. 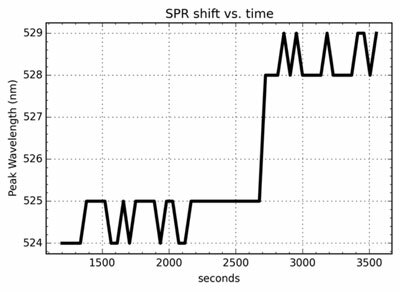 Next, the plasmon resonance shift vs. time is analyzed. Pandas already has a method that returns the index corresponding to the maximum value for every curve in the dataset: idxmax(). Since scikit-spectra objects inherit all Pandas methods, idxmax() is also a TimeSpectra method. The method, ts_cut.idxmax(), returns a Spectrum class whose plot() method is then called. The result, shown in Fig. 3, indicates that the plasmon resonance hovers between 524–525nm, then shifts about 4 nm to 528–529nm. The jagged nature of the trend merely reflects the 1nm resolution of our benchtop spectrometer. Absorbance spectra maximum vs. time shows the movement of the plasmon resonance position after protein binds to the AuNPs. Most of the analysis so far could have been performed in one of scikit-spectra’s Notebook GUIs. At any point in the workflow, one could have opened the GUI, manipulated the data, exported it back into the Notebook namespace, and resumed working through the API, exemplifying the philosophy of the GUI when you want it, the API when you need it. The code needed to run the GUI and a screenshot of the result are shown below in Fig. 4. The GUI supports nine plot types, as well as interactive plots through mpld3. 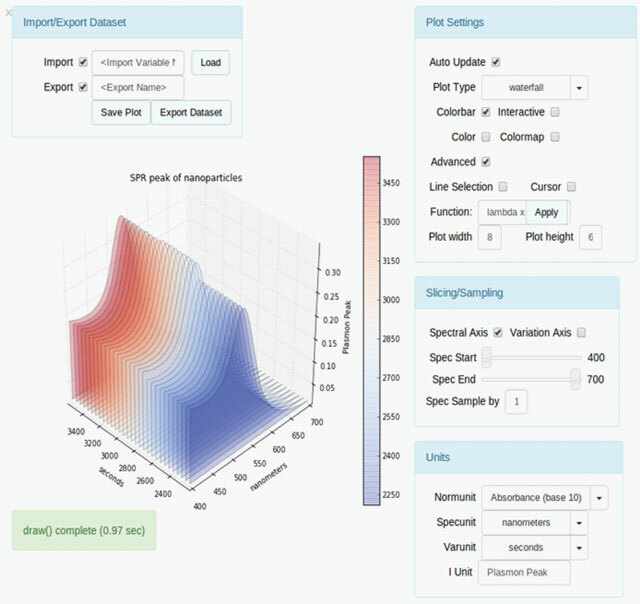 A video tutorial of the GUI is available on the scikit-spectra website. IPython Notebook GUI for plotting, slicing, resampling, changing units and IO. Scikit-spectra provides a natural framework for generalized spectroscopy applications, such as two-dimensional correlation spectroscopy(2DCS), factor analysis and chemometrics. An API for 2DCS has been implemented, with the intention of turning scikit-spectra into the de-facto toolkit for correlation spectroscopy. While there are a few graphical applications for 2DCS, like 2dShiege and MIDAS in MATLAB™, there is no corresponding API-level toolkit available. To demonstrate scikit-spectra’s 2DCS API, the asynchronous4 correlation spectrum of the AuNPs dataset will be analyzed. Asynchronicity, Ψ(λ,λ), measures the spectral distribution of uncorrelated events over a time5 interval. For example, if a peak at λ=a forms early in an experiment, and then later a second peak at λ=b appears, then there is asynchronicity at Ψ(a,b) because these events occurred at different times: they are uncorrelated and likely due to different underlying processes in the system. If the peaks had formed at the same time, then they would be regarded as highly synchronous. Together, synchronicity and asynchronicity encompass all of the variance in the dataset. 2DCS applications are discussed much more extensively in the scikit-spectra documentation. For datasets with many spectral peaks, 2DCS can often resolve otherwise intractable information about the order and nature of events in the system. Fig. 5 illustrates the asynchronicity at wavelengths ranging from 200 to 600nm in the absorbance spectra. The time-span, spectral unit, spectral symbol and other metadata appear in the default plot labels, demonstrating the connectedness of scikit-spectra’s units and plotting APIs. Strong cross-peaks between the ultraviolet and the plasmon resonance regions indicate that at some point in the experiment these peaks change asynchronously. This is verified by looking back at the data and observing that the initial protein binding leaves the nanoparticles saturated, with no binding-sites for a second addition of proteins. However, the additional protein does increase the absorbance in UV region. In other words, adding protein late in the experiment increases short-wavelength absorption, but has no effect on the plasmon resonance shift, resulting in asynchronicity between the 250nm and 530nm regions. Asynchronous correlation spectrum of gold nanoparticle absorbance at wavelengths ranging from 200–600nm. The strong cross peaks between the UV and plasmon resonance regions (roughly 525–550nm) corresponds to the time after nanoparticle-protein binding is saturated. Addition of more protein causes a UV response, but no response in the plasmon resonance region, resulting in this asynchronicity. Sideplots show the mean-centered average spectrum from the full set. Scikit-spectra includes a preliminary nose test framework, inspired by the excellent Pandas test suite. A collection of tutorials and website examples are batch-run to catch breaking-changes that are not covered by the nose tests. Scikit-spectra has been tested on Ubuntu 10.04, 12.04, 13.10; Mac OS 10.8, and Windows 7. Scikit-spectra is built for generalized applications, and built on the already successfully Pandas library. Scikit-spectra’s core design is adaptable to many branches of spectroscopy, such as NMR, IR and Raman. Ideally, each branch will eventually be supported as a distinct subset of scikit-spectra, built on the same core framework. This is a long-term goal and will require contributions from many scientists and developers. The vision for scikit-spectra is to adapt and interface with other spectroscopy libraries, not supplant them. Unifying Python’s spectroscopy libraries, whether or not it ultimately involves scikit-spectra, is critical to bringing open-source solutions to the research community, much in the same way that ImageJ has brought open-source image processing into the mainstream. Interested developers are welcome to contact the authors with suggestions or ideas. 1Scikit stands for SciPy Toolkit, which are SciPy-based libraries deemed too specialized to live in the core SciPy distribution. 2The term “explorative” refers to an API compatible with SciPy libraries to streamline customized analysis visualization. 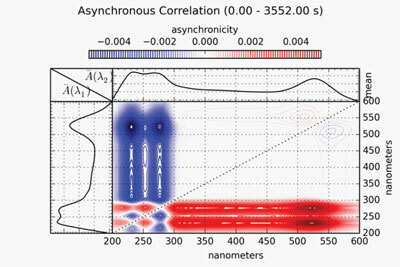 4The synchronous and asynchronous correlation spectra are fundamental to 2DCS. Some important new developments include generalized scaling of correlation spectra[X] and the derivation of the so-called codistribution spectra[X], both of which are built into scikit-spectra’s 2DCS API. 52DCS is also applicable to non-temporal datasets, for example spectra changing as a function of pressure, temperature or any other “perturbation variable”. Bohren, H (1983). Absorption and Scattering of Light by Small Particles In: John Wiley & Sons, INC.
Ginsburg, A and Mirocha, J (2011). ‘PySpecKit: Python Spectroscopic Toolkit’. Astrophysics Source Code Library. record ascl:1109.001 URL: http://adsabs.harvard.edu/abs/2011ascl.soft09001G. Gorsuch, R L (1983). Factor Analysis In: 2nd edn Hillsdale, NJ: Lawrence Erlbaum Associats, Inc..
Helmus, J and Jaroniec, C (2013). ‘Nmrglue: An open source Python package for the analysis of multidimensional NMR data’. Journal of Biomolecular NMR 55(4): 355–367. URL: http://link.springer.com/article/10.1007/s10858-013-9718-x. Hoyer, S (2015). ‘xray: N-D labeled arrays and datasets in Python’. URL: https://github.com/xray/xray. Hughes, A and Liu, Z (2014). ‘scikit-spectra: Tools for explorative spectroscopy’. URL: http://hugadams.github.io/scikit-spectra/. Jones, E, Oliphant, T and Peterson, P (2001). ‘Scipy: Open source scientific tools for Python’. URL: http://www.scipy.org. Jordahl, K (2014). ‘GeoPandas: Python tools for geographic data’. URL: https://github.com/geopandas/geopandas. McKinney, W (2010). van der Walt, S. and Millman, J. eds. Data Structures for Statistical Computing in Python. ‘Proceedings of the 9th Python in Science Conference’. : 51–56. URL: http://pandas.pydata.org/. Morita, S (2002). ‘2D Shige’. URL: https://sites.google.com/site/shigemorita/home/2dshige. Nájera, O (2014). ‘Sphinx-Gallery’. URL: https://github.com/sphinx-gallery/sphinx-gallery. Noda, I (2007). ‘Scaling techniques to enhance two-dimensional correlation spectra’. Journal of Molecular Structure 883–884, : 216–227. URL: http://linkinghub.elsevier.com/retrieve/pii/S0022286007008411. Noda, I and Ozaki, Y (2004). Two-Dimensional Correlation Spectroscopy In: Wiley. Normand, E (2011). MIDAS 2010: Mid-Infrared Data Analysis Software 2010 A Matlab Package for 2D IR Spec-troscopy Analysis. URL: http://www.mathworks.com/matlabcentral/fileexchange/32384-midas-2010. Oliphant, T E (2007). ‘Python for Scientific Computing’. Computing in Science & Engineering 9(90) URL: http://www.numpy.org/. Pedregosa, F et al. (2011). ‘Scikit-learn: Machine Learning in Python’. Journal of Machine Learning Research 12: 2825–2830. URL: http://scikit-learn.org/stable/. Pellerin, J (2009). ‘nose’. URL: https://nose.readthedocs.org/en/latest/. Perez, F and Granger, B (2007). ‘IPython: a Stystem for Interactive Scientific Computing’. Computing in Science and Engineering 9(3): 21–29. Roemer, R (2014). ‘Sphinx Bootstrap Theme’. URL: http://ryan-roemer.github.io/sphinx-bootstrap-theme/. Schneider, C A, Rasband, W S and Eliceiri, K (2012). ‘NIH Image to ImageJ: 25 years of image analysis’. Nature Methods: Focus on Bioimage Informatics 9(7): 671–675. URL: http://www.nature.com/nmeth/journal/v9/n7/full/nmeth.2089.html. Sphinx: Python Documentation Generator (2014). URL: http://sphinx-doc.org/index.html. Vanderplas, J (2014). ‘mpld3: Brining Matplotlib to the Browser’. URL: http://mpld3.github.io/. van der Walt, S, Nunez-Iglesias, J, Boulogne, F, Warner, J and Al, E (2014). ‘scikit-image: image processing in Python’. PeerJ (453) URL: http://scikit-image.org/. Willets, K A and Van Duyne, R P (2007). ‘Localized surface plasmon resonance spectroscopy and sensing.’. Annual review of physical chemistry 58: 267–97. URL: http://www.ncbi.nlm.nih.gov/pubmed/17067281.